Holy Baptism is an affirmation that the future of humankind is rooted in God’s love. At the end of the Gospel of Matthew Jesus tells the disciples to go out and baptize wherever they go, and promises that he will be with them – and all who seek a nearer relationship with God – “even until the end of time” (Matthew 28). If you are reading these words you may be considering the sacrament of Holy Baptism for your child, yourself, or someone you love. Perhaps you just want to know more about this sacrament of the Church, a rite of passage that goes back to the early disciples and into our Jewish heritage thousands of years before Christ. 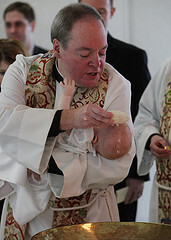 Holy Baptism is a time of joy and welcome into the community of faith. It is also a rebirth – and the beginning of life as a follower of Jesus. It offers the opportunity to renew or deepen the spiritual journey for everyone involved. 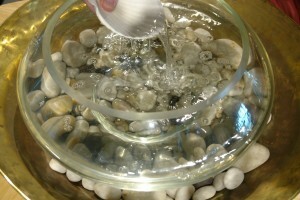 Click here to view our booklet which gives an overview of Holy Baptism at Saint Mark’s. It has sections on when Holy Baptism typically happens, what to expect and how to get started. Click here for our Holy Baptism application form. This printable form can be sent or brought to Saint Mark’s. Click here to complete the Holy Baptism application online.